New Mexico and Delaware are the latest to join the pact which aims to pool states’ Electoral College votes and give them to the winner of the national popular vote. New Mexico Gov. Michelle Lujan Grisham signed legislation on April 3 to include the state in the National Popular Vote Interstate Compact (NPVIC). 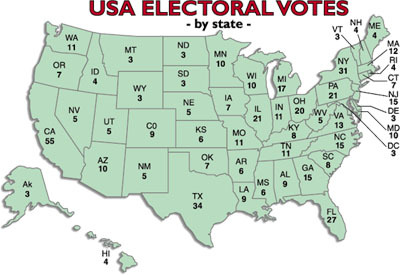 NPVIC members include (electoral votes in parentheses): California (55), New York (29), Illinois (20), New Jersey (14), Washington (12), Massachusetts (11), Maryland (10), Colorado (9), Connecticut (7), New Mexico (5), Hawaii (4), Rhode Island (4), Vermont (3), Delaware (3) and the District of Columbia (3). All of them were carried by Hillary Clinton in 2016. Legislation to join the NPVIC passed through both chambers of the New Mexico legislature with no Republican votes, according to the state’s website. Gov. John Carney on March 28 signed legislation to include Delaware in the pact. Both Grisham and Carney are Democrats. Adding in New Mexico’s 5 and Delaware’s 3 electoral votes, the NPVIC members’ electoral votes add up to 189. The compact could become official when that number hits 270, or enough votes to elect the President of the United States. Legislation to join the NPVIC has also been introduced in Nevada, Oregon and Maine. Ohio and Minnesota are also said to be considering legislation to join the compact. The NPVIC does not abolish the Electoral College, which requires amending the Constitution. Rather, by binding electors to vote for candidates achieving a plurality outside their own state, it achieves the results of a popular vote.